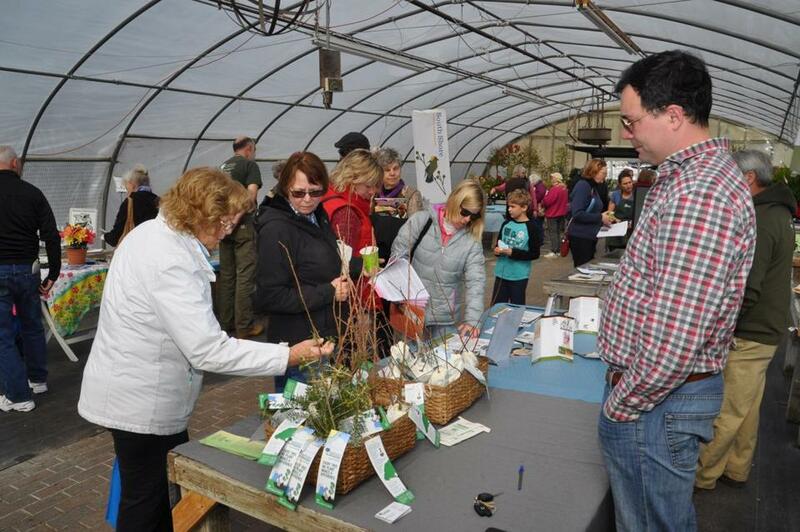 Abraham Monahan of Bartlett Tree Experts gave away free tree saplings at the 2018 Gardening Green Expo. Catch all the buzz about bees and other pollinators at the 2019 Gardening Green Expo in Scituate. The seventh annual expo focuses on the theme “Planting for Pollinators” and takes place at Kennedy’s Country Gardens, 85 Chief Justice Cushing Highway (Route 3A) on March 30 from 10 a.m. to 4 p.m. The expo hosts hourly talks by a series of speakers starting at 10 a.m. and also promises vendors, products and services to benefit the growth of your garden and lawn. The WaterSmart program, North and South Rivers Watershed Association, and Kennedy’s Country Gardens are sponsoring the free event. Maureen Hancock, a spirit medium, will be on stage at The Marilyn Rodman Performing Arts Center in Foxborough. “Postcards from Heaven” features lighthearted humor and messages from the afterlife. The event is for ages 14 and up and takes place at 1 School St., Foxborough, on Friday, March 22, from 7 to 10 p.m. Doors open at 6 p.m., and not everyone will receive a reading. Tickets are $45 for general seating and $65for preferred seating and a post-show question and answer session. Buy tickets at www.maureenhancock.com/events/. Join Mass Audubon South Shore Sanctuaries and Marshfield’s Stellwagen Beer Company for Tap Into Nature, a 21+ event, on Tuesday, March 19, from 7 to 9:30 p.m. The event will feature information about Mass Audubon, live music from Lonesome Jukebox, games, appetizers, and prizes. Proceeds will help Mass Audubon introduce schoolchildren to nature. Tickets include appetizers, games, and one pour or flight per person and are $40 for Mass Audubon members and $48 for nonmembers. The address is 100 Enterprise Drive, Marshfield. Required registration can be completed at www.massaudubon.org/northriverprograms or by calling 781-837-9400. President John Adams and his wife, Abigail, were world travelers who developed a cosmopolitan Christianity that blended discovery, criticism, faith, and doubt. Historian Sara Georgini will discuss her new book, “Household Gods: The Religious Lives of the Adams Family,” in Quincy on March 23 from 3 to 5 p.m. A reception, book signing, and tour of the Presidential crypt follows the lecture at the Church of the Presidents (United First Parish Church) on 1306 Hancock St. The Abigail Adams Historical Society and the Church of Presidents sponsor the free event. Doors open at 2:30 p.m. Visit www.rememberabigail.org for more information. The national political season is heating up, but people shouldn’t forget about their local representatives. Meet the new state representative for the 12th Plymouth district, Kathy LaNatra on March 26 from noon to 2 p.m. at the Plympton Public Library, 5 Palmer Rd. LaNatra is a Democrat and represents the towns of Kingston, , Halifax, Plympton, precinct one of Middleborough, precinct 1 in Duxbury, and precincts 1, 11 and 13 in Plymouth.